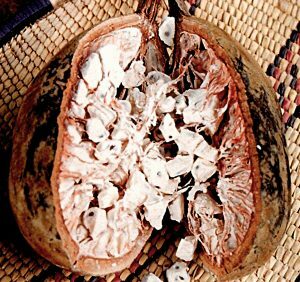 BAOBAB OIL – this exquisite oil is cold pressed from the seeds of Baobab fruit trees, which are native to Southern Africa, and can live up to a thousand years. In order to achieve this, it is a powerhouse of Vitamins and rare nutrient profiles. Vitamins A and B firm, tighten and hydrate skin. Its Vitamin C content is 6 times more than an orange, and this helps with skin elasticity. Vitamins D, E and F, help to rejuvenate damaged skin cells. are a highly emollient moisturizer for the skin. hold back UV photo-damage from the sun, at cellular level. heighten the anti-inflammatory response, within the skin layers. reduce skin sensitivity to allergens. reduce eczema, psoriasis, and atopic dermatitis, all of which are often caused by a deficiency in EFA’s. For a complete external and internal spectrum of benefits, you can increase your EFA and Vitamin profile, by using this raw, cold pressed, organic Baobab Oil over your food.